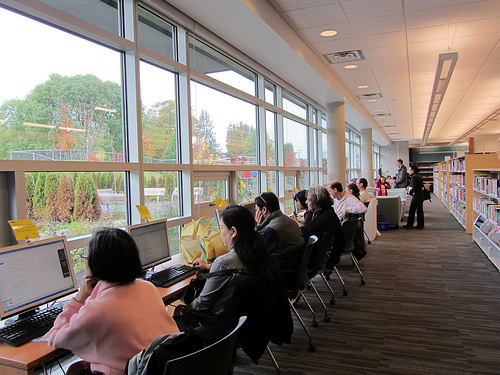 Check the Vancouver Public Library website for general information on opening hours, etc. If you want to print copies from Ancestry Library Edition, please remember that all print requests should be made at least half an hour before the library closes. Explore all the other Genealogy and Family History web pages to get a better idea of what you can expect to find in the Vancouver Public Library genealogy collection. Bring supplies. Come prepared with paper, pencils and other supplies that you might need. There are power outlets for your laptop. Wireless is available. Bring research materials. Copies of genealogy charts, documents, and notes may be helpful not only for you but also for the information staff if you need help. Bring money if you expect to make copies of documents. Printing and photocopying costs 20 cents per page for black and white and 75 cents per page for colour. Discounted price is available on double-sided copies. Copies from microfilm reader-printers are 40 cents. Copy cards may be purchased on Levels 2 and 7 and may be used for regular and micro-reader prints. Remember that the information staff are very busy. Please ask specific questions. This is not the time to give a full account of your family history research!